Base CRM is one of the leading CRM apps currently available on the market. The list of reasons behind those awards is quite long, as Base CRM helps to significantly improve your team’s sales productivity, and provides you with the sales tools necessary to grow your business. It allows you to improve your business relationship with customers by storing and syncing all emails, call records and recordings, and notes you’ve shared with them and your partners. 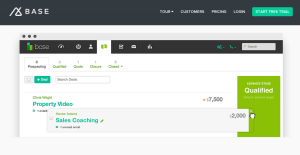 You can also customize sales stages and work with your team on various opportunities, activities, and notes. To make matters even better, Base also helps you with leads and assigning them to the right sales reps. Likewise, it makes it possible to quickly look at strengths and weaknesses in your business workflow to boost sales performance and forecast sales. You can access the application even if you are away from your business—Base’s mobile application will ensure you are still on top of your business even if you are on vacation or on a business conference anywhere in the world. You can track your productivity and boost sales 24/7, as Base offers separate, dedicated apps for all types of mobile devices. Another important advantage is that Base CRM can be synced with various programs and third-party apps such as Outlook and Gmail to streamline your data which you can parse and filter. In addition, you can use Base in social networks to interact with your customers in a more familiar way. The pricing scheme is flexible as there are three separate plans to meet the needs of different businesses. Startups and small companies can hit off with their Starter package ($25/month), while enterprises get a fully-featured, all-in-one sales suite for $125 per month. A great 14-day free trial is also available to all users interested in test-driving the system first, and there is also the possibility to contact a sales expert and have your questions answered before you’ve completed the purchase. Support is generally an important highlight of this system, having in mind that tech experts are always a phone call away from answering questions that may come up. Base’s team understands the hassle of using several systems to communicate, sell, and manage productivity, which is why it hooks up all of your functionality in a single platform. It can be your CRM and sales system all in one, and will allow you to connect it to your email providers, phone dialers, scoring and reporting packages, and much more. Base can significantly boost your team’s sales productivity by giving you a fully-featured set of core sales tools. It also includes a sales tracking solution allowing you to customize sales stages according to your needs and easily track opportunities. All sales deals are stored and categorized in the Sales Pipeline section, where you can customize them, and add leads, records, and collaborators upon need. Another handy possibility is to import you CSV data files, and then map the fields with Base CRM fields to determine a match. The system will do this automatically, but you can also manually add as many fields and records as you want. Another distinctive advantage of this system is that users will not have a hard time navigating through its user-friendly dashboard. Simply put, no programming skills or knowledge are required for you to operate Base. The functions are intuitive and features are familiar, so that even least savvy users would benefit from it to improve their profit rates. Same goes for importing/exporting data, and connecting this system to third-party apps and services. Base makes it easy to set up revenue goals for you and your entire team. With Base CRM, there is no more confusion or misunderstanding about the goals and tasks assigned to you or your team. The collaborative nature of this system and the multiple integrations ensure data will flow seamlessly in and out of it, and that files can be shared securely. Based on the data you’ve inserted into the system, you will also be able to trigger Base to track communication, and store discussions and voice calls with leads and partners. Base will also allow you to manage customers in one system, anywhere you go, on any of the devices you use—even on a smartphone. It keeps track of all the information, even phone calls you have with your customers and their exchanges with you. Your emails to customers can be automatically synced and sorted for easier recall and more cohesive customer relationship experience, as agents will have access to their data regardless of their devices and locations. Base delivers a suite of visually appealing and accurate reporting templates which add an enjoyable side to the otherwise dull sales calculations. Basically, you have world-class reporting at your fingertips, and you are not expected to perform any setup activities on your own to make it work. Integration is another field where Base CRM shines, as this system is seamlessly connected to a variety of third-party apps and business systems. You can use it in synergy with your favorite social networks (it collects leads from Facebook, Google, and Twitter), connect it to nearly every email service provider, and make it an integral part of your software ecosystem where you already work with Zapier, MailChimp, Yesware, Xero, Harvest, and other systems. When purchasing software, you should pay specific attention to whether this system comes with the necessary assistance and support to prevent/solve whatever difficulty you may experience in future. Base CRM is a safe choice when it comes to support, as qualified experts are always available via email of phone to answer your questions and solve any issues you may have. What is more, you get to contact a sales expert before you’ve made a purchase, and explain the specific needs of your business to get the best recommendation. Base is not a new player in the CRM and sales industry, and their large list of prominent customers is there to prove it. The system owns much of its positive reputation to names such as Xerox, Micro Documentaries, Cisco, and Wells Fargo, which have nothing but good words to share on the productivity it offers. Step by step, Base adopted their customers’ recommendations, and learned from the best to innovate its product and make it as powerful as it is today. The thing that makes Base CRM suitable for large enterprises as well as for small companies is its flexible pricing scheme, as the company offers affordable packages for startups ($25/month), and fully-featured sales kits for enterprise-grade users ($125/month). A 14-days free-of-charge trial is also available for all users interested to explore the features first. Each enterprise has different requirements and needs a software that can be customized for their size, type of staff members and clients, and the particular industry they are in. For these reasons, no system can provide perfect functionality out-of-the-box. When you look for a software app, first be sure what you need it for. Read some Base CRM reviews and ask yourself do you desire basic functionality or do you need sophisticated tools? Are there any industry-specific tools that you are searching for? Find the answers to these questions to aid your search. There are plenty of elements that you need to mull over and these include your budget, specific business requirements, your company size, integration needs etc. Take your time, try out a few free trials, and finally select the platform that offers all that you want to boost your company effectiveness and productivity. How Much Does Base CRM Cost? We realize that when you make a decision to buy CRM Software it’s important not only to see how experts evaluate it in their reviews, but also to find out if the real people and companies that buy it are actually satisfied with the product. That’s why we’ve created our behavior-based Customer Satisfaction Algorithm™ that gathers customer reviews, comments and Base CRM reviews across a wide range of social media sites. The data is then presented in an easy to digest form showing how many people had positive and negative experience with Base CRM. With that information at hand you should be equipped to make an informed buying decision that you won’t regret. What are Base CRM pricing details? What integrations are available for Base CRM? Pros: For me, the plus points of Base CRM are it offers fantastic features and an amazing mobile experience at an affordable cost. Cons: I have no issues with the CRM software. But I would like to see iOS map integration in the "Location" part of the calendar. I can simply tap on the address to open the Maps app which would help me to find my destination easily. Pros: I love that Base CRM’s layout is easy to navigate. I can set up my pipeline any way I want. The email integration is smooth. I can easily add leads, contacts, and deals, and add documents to each contact and deal. Finally, it is easy to customize the app for our needs. Cons: Base CRM offers a few similar features that are unnecessary, for example, Tasks and Appointment, and Leads and Contacts. I know they are different but they create a lot of extra work for me. For me, the plus points of Base CRM are it offers fantastic features and an amazing mobile experience at an affordable cost. If you need more information about Base CRM or you simply have a question let us know what you need and we’ll forward your request directly to the vendor.